Pinnacle Black Label Diamond Paint Coating is a ceramic coating that creates an extremely glossy, impenetrable layer of protection on your vehicle’s paint. Formulated using the most advanced nano-glass ceramic particles available in a paint coating, Diamond Paint Coating shields your vehicle against UV rays, airborne contaminants, dirt, acid rain, road salt, and other common pollutants that attack your vehicle on a regular basis. Spray and wipe application lasts up to 3 years! Black Label Diamond Paint Coating is going to forever change the way you look at car care and detailing. Formulated using ingredients that were previously unheard of in a car wax or paint sealant, Diamond Paint Coating blankets your vehicle in a hardened glass membrane that resists dirt accumulation and surface staining. The barrier of protection has a heat tolerance higher than any conventional wax or sealant, making it the obvious choice for the perfectionist that demands the best protection for their vehicle. Black Label Diamond Paint Coating and the glassy shine that it creates lasts up to 3 years. This state-of-the-art paint coating was designed to deliver a show-car shine in a simple spray and wipe application. Diamond Paint Coating is actually easier to apply than your favorite carnauba paste wax! What’s more, a single 4 ounce bottle is enough to coat up to 5 vehicles! Step 1: Polish surface using Black Label Surface Cleansing Polish. This is the MOST IMPORTANT step; if the paint isn't polished, the coating will not bond. Step 2: Spray Diamond Paint Coating directly onto the surface and evenly distribute using a Lake Country Coating Applicator. Step 3: Gently remove excess residue using a Gold Plush Microfiber Towel. Black Label Diamond Paint Coating with its nano-glass formula is resistant to alkaline cleaners, degreasers, and harsh detergents. 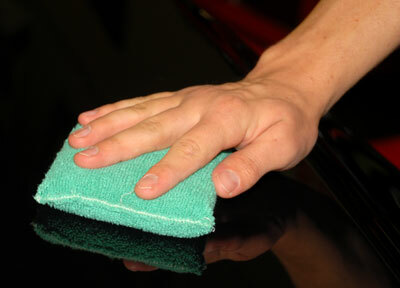 Compared to your clear coat, Diamond Paint Coating is more resistant to scratches and marring. The nano-glass formula forms such a hard shell of protection that virtually nothing can penetrate or stick to it, making your vehicle retain that just-detailed shine for years! 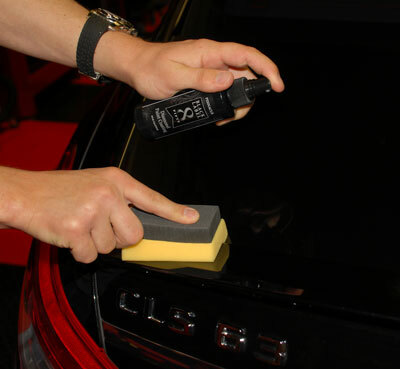 Another advantage to Black Label Diamond Paint Coating is the self-cleaning effect that it provides. The nano-glass formula fills in the microscopic pits, pores, and valleys of your vehicle’s paint, creating a perfectly smooth, flat surface. Dirt and road grime will be removed with virtually no effort, making your vehicle easier to clean and maintain. Surface care products that bear the Pinnacle name are expected to outshine anything else available, and Diamond Paint Coating is no exception. After being treated, vehicles will look as though molten glass was poured over them creating the appearance of a silky, glass-like shine that causes light to reflect, not refract. Diamond Paint Coating can be topped with your favorite carnauba wax, like Pinnacle Souveran, to add a warm carnauba glow. Black Label Diamond Paint Coating should only be applied to vehicles that have first been polished with Black Label Surface Cleansing Polish. This step is crucial as it removes contaminants, oils, and fillers that would otherwise prevent the coating from bonding. Once that is completed, application of Diamond Paint Coating is as simple as spraying on and evenly distributing with a foam applicator. Wait 24 hours before topping with your favorite carnauba paste wax. Use Black Label Diamond Coating Shampoo to rejuvenate the shine and water beading. Place your hand in a plastic sandwich baggy and feel the paint. If it feels rough or gritty, use Pinnacle Ultra Poly Clay. Working one panel at a time, spray Diamond Paint Coating directly onto the paint and evenly distribute using a Lake Country Coating Applicator. Work the coating into the paint until it disappears. If high spots occur, lightly buff with a Gold Plush Microfiber Towel. I installed this coating two months ago, so longevity is yet to be determined. I went with the PBL system because of it's claimed and reviewed ease of use. It was very hot in my garage when I applied the coating, and it flashed much faster than I would like. I wanted to work the coating until it would self level, but after two passes, the coating was hard. I'm sure it would have been different in a cooler environment. One word of warning about this coating- it not only won't hide scratches, it almost seems to amplify them, especially when first applied. Make sure your paint is completely to your satisfaction before coating it. This isn't a knock on the product, because I think most coatings do this. The coating actually looked better three weeks after application than it did a few hours after. The best part is the hydrophobicity of the coating. Very impressive. I don't mind rainy days, because at speeds over 30 mph, the water beads march like soldiers over my hood. I have noticed some light water spotting if drops are allowed to bake in the sun, but the PBL detailer easily glosses over these, and I use it as a drying aid. If you are on the fence about trying a coating, don't hesitate to try the Pinnacle. Like every Pinnacle product I've used, it meets or exceeds my expectations, and the "Wow Factor" eases any buyer's remorse after use. ProsAmazing "candied glass" shine that only gets better with full cure after several weeks. Easy application. Excellent water beading. The "Self Cleaning Effect" is not a myth! Hydrophobicity makes drying with a blower fast and easy. ConsIt's not cheap, especially when you add the cost of prep polish. Surface must be perfectly clean to apply. (not much of a "con", just a caveat!). It makes swirls you missed and RIDS stand out, especially when first applied. Must (In my opinion) be applied in cool conditions. Tested, and works as advertised. I do not have v.2, but the first version of this. I can tell for this stuff works as advertised. I applied it on my VW Golf when I bought it brand new back in the beginning of 2014. After almost 3yrs the coating is finally starting to degrade, but that's mainly on the roof, and the C pillars. I can tell because the water doesn't bead up as much as it used to there. If anyone is complaining about this sealant, its because they are not following the directions. It is key that you prep the paint so it is as clean as possible. I used the Black Label cleansing lotion as recommended for prep and I can understand why. The lotion cleans the paint extremely well so use it. Also when applying the sealant make sure you follow the directions exactly how it tells you to. When you apply it with an applicator pad, it is key that you continually rub it in until it drys on its own. Then you can do a gentle buff with a microfiber. (Do not) just spray it and spread it around and then proceed to buff with a microfiber (this isn't a waterless wash spray). If you have a little patience and do it right your efforts will payoff. Cleaning the car after the sealant cured was a breeze. Because of the hydrophobic properties of the coating, nothing likes to stick to it. So when it comes time to do your regular hand wash its fast and easy. Pros-Highly resilient to fallout and bird droppings -Water beading is excellent. -Super easy to clean the car once the coating has cured. -The shine quality I would say is above average for a sealant. -Durable, not as easy to scratch for sure. Cons-Getting the paint as clean as possible is key, but time consuming (this applies to any coating though) -Expensive -Leveling or (high spots) can be an issue. I'm assuming that's part of the reason for v.2 because it can dry quickly when you're not quite finished applying. Can be fixed with a light buff of a microfiber, but its not always easy to spot if you have light colored paint. On the flip side, on dark colored paint its noticeable if the coating is not level. Did a test vehicle my black 2015 Z-71 Silverado last year. Comparing it to my 2005 Black Silverado daily which has the standard paint correction, clay and Griots wax every year. you can definetly see a difference in the "brightness and depth" of the paint before and after washing on the 15. The 05 shows the expected cloudiness and graying down from air pollution etc where as the 15 just shines through. Impressed enough that this year pulled the trigger on the rest of the fleet did my kids SUVs 03 Drk blue metallic, Blazer, 06 Silver blue, Trailblazer and my 98 maroon metallic, Silverado. All have received the yearly paint correction or over all Griots 3 or 4 then claying and waxing. The 98 has received this treatment since new and comments are almost daily about the quality of the paint. I am top coating this year with Griots Best of Wax on the rest and trying Pinnacle Series II on the 15. Before the top coating the others their paint just pops with that glass look. May try glazing on a few spots on the older vehicles though they say it may not 'stick'. ProsNot a slick feeling surface, but looks like glass and everything floats off with a simple wash. Water and soap actually bead up and slide off car. Water beading up nicely still even after a year. I re-applied a second coat after a year and will continue to so I can't speak to the 3 yr longetivity. Top coating this year getting a nice deep carnuaba type shine will see how long the top coat lasts compared to with or without the diamond coating underneath. ConsDoesn't cover as many applications as advertised. not even close. extremely fast flash off time, really need under 80 degrees to apply easily or work really small areas and buff quickly. Although I like the Black Label Surface cleaner polish thats recommended its over-priced also. Also the pump on the bottle usually doesn't work 1 out of 3 bottles didn't work (lost half a bottles contents because of that, pump stuck open). Plus I really think the 'polish" is so fine not to make a difference. Save some money or elbow grease, I've use Griots paint prep and Blackfire crystal coat paint prep. Both are an easy wipe on wipe off product. and if the paint needs any polish or correction use an advanced swirl polish remover like Blackfire, Pinnacle or Griots #4 before the paint prep. Easy to Use, but is is really better than a sealant or wax? 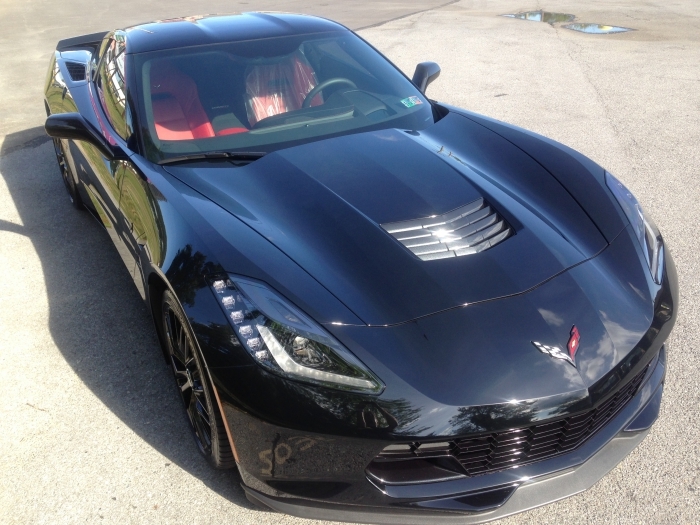 I used this on my 2014 Stingray (black) with great results and was super easy to apply. 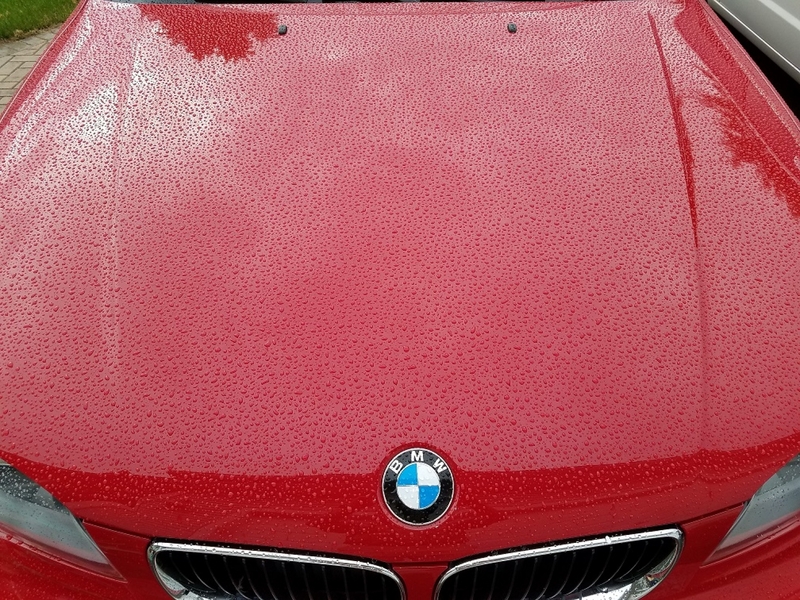 I first prepped the car with Carpro Essence, and applied this coating 2 days later. I know this may not be the "standard" prep, but I've read from several members that it works great on top of Essence, and decided to give it a try. It flashes almost instantly and as a result, I used way more than I expected to. Every panel took multiple sprays with each spray only spreading a short distance before "disappearing" on the paint. I found it very difficult to tell what was covered and what wasn't due to the almost instant flashing of the product. With that said, I did the whole car in less than an hour. I applied it indoors with low humidity and temp about 70-75 degrees F. I found the following day when I backed it into the sunlight there were several streaks that buffed away easily with a clean microfiber towel. I have not topped it with anything, as that seems to be counterproductive to using a coating in the first place. If it holds up for years as advertised i'll be amazed, but to be honest it's so easy to apply, I will simply add another layer if beading starts to diminish. I'm also curious to see how it does against scratching and micromarring. I am skeptical it will prevent any of this any more than a sealant or wax, but time will tell. ProsEasy to use, "high spots" buff out easily. Really seems pretty idiot proof. Very easy to use and the next day i topped it of with pinnacle black label synergy wax and the result was excellent the shine and depth and the way the light bounces was out of this world even the carbon fiber body parts shined like 3 dimension. I recommend this product one of the easiest coating i ever used i hope the durability would last as long as the coating thats in a syringe type like optimum gloss coat or wolfgang ceramic coating but so far it lokks good.